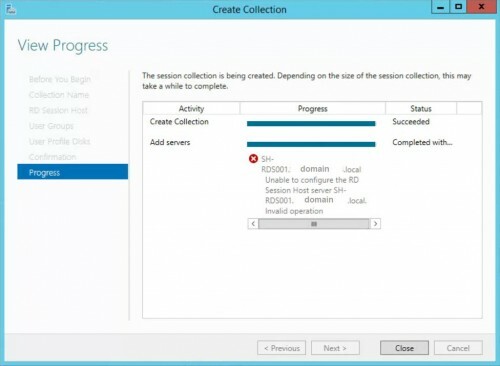 Posted in Remote Desktop, Windows Server 2012 R2 by ronnypot at February 24th, 2016. I came across this error while upgrading my domain controller to Server 2016. I previously set up a RD server and had GPOs applied. I also had local GPOs configured. I started troubleshooting by removing the RD server from any OUs with GPOs, but this didn’t work. I had to run gpedit.msc on the local RDS server and edit the settings there also. Once I modified both the Domain GPO and the Local GPO, the Wizard completed successfully. Your post should elaborate on this last comment. “If you already set local policies on the RD Sesions Host policy these also need to be removed.” If you are not a Windows GPO expert, you may not know that the local GPO has to be checked in addition to the Domain GPO. Thank you for this. This really helped. As you suggested, I disabled the policy associated with Licensing below, deleted the collection and recreated the collection with success (no error now). I had originally configured the above (enabled “Use the specified Remote Desktop license servers” and “Set the Remote Desktop licensing mode”) in order to active my RD CAL licensing. So, if I re-enable these two parameters now, will that impact my collections now that it has been successfully created? Otherwise, my third-party app using the RDS will have issues because it isn’t licensed, correct? I’m having the same question … I changed the OU computer and I was able to create a collection in trouble. However now I need to move the computer back to a correct OU as I need the licensing to be OK. In this case I will not have problems? Hi, i was wondering how this worked out for you as i am on the same boat now. I had a similar issue when trying to uninstall then reinstall RD services on 2016. When I tried to reinstall I got an error relating to group policies but when I checked, there were none that related to remote desktop being applied. I was able to fix it by deleting the whole HKLM\SOFTWARE\Microsoft\Windows NT\CurrentVersion\Terminal Server\CentralPublishedResources\PublishedFarms\QuickSessionCollection key.